Whether you’re buying a gift to pamper mom-to-be, to shower the new bundle of joy, to thank the hostess or to reward the game-winning guest, you want to get the right gift at the right price. While it’s not always easy to judge what another family will find tasty (too spicy? too fishy? too rich? too light? ), an simple solution is to pickup takeout from a popular restaurant like Chili’s, TGI Fridays, or Subway. Before choosing where to pickup the meal, check with Anncoupons.com for the best discounts. The amount you save may be enough to cover dinner for your family too! Gifts that show you planned ahead are especially thoughtful – and can even be organized last minute! Who doesn’t love to be surprised with flowers, plants, chocolates or fruit delivered right to their door? All it takes to say thank you is a simple order that can even be placed the day before. 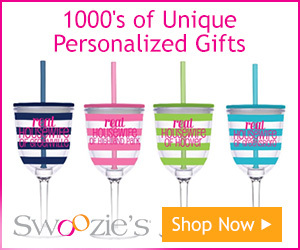 If you didn’t wait until the last minute, arrange for personalized gift that is monogrammed or engraved. There are a variety of online companies that offer these services now, so review all the offers together at Anncoupons.com before you buy. Prizes can be tricky, because they should be generic enough to appeal to everyone’s tastes but still be rewarding enough to motivate the participants. These are simple gift ideas because they have broad appeal, and you can often find discounted prices too. Big budget? Think designer wallets, cute clutches, sparkly earrings or trendy scarfs. Still stumped? Click through the deal of the day to find inspiration & bargain prices. Make sure you check back often – deals come & go quickly and you won’t want to miss out! * This is a sponsored post representing my own honest opinion and has not been edited by the company prior to publication. These baby shower games will make sure people are talking about your shower for long after the baby is born. The games are not expensive either – most you can play with items you have in the house! Be warned – you might have your mom-to-be laughing so hard she she’ll pee! Whether you’ve thrown lots of baby showers or are planning your first, this is a great resource for FREE baby shower games! I’ve left out the horrible games (Guess Mom’s Girth = NO!) & only included the fun ones. Be sure to check them out for baby shower idea inspiration! Coed Baby Shower Games – Great Games for the Men! Planning a couples or coed baby shower? Make sure to include at least one game with men in mind, so they have fun too. Warning: these games can be messy, so let the ladies sit back and enjoy watching the men mildly embarrass themselves in the name of friendly competition! Great game idea for the mom-to-be who does not want to be stared at while opening gifts! Baby Gift Bingo is played during the baby shower, as presents are opened. Free printable cards included (along with fun baby shower gift ideas!). If you keep your spending on the baby shower games to a minimum, you can use your budget toward the prizes! These baby shower game prizes are based on the theme of the game using the list of FREE baby shower games described above. Baby shower favors are definitely not necessary. Most guests will be happy with some good food, friends and an entertaining game or two. Even so, some hosts do like to offer favors for guests at the end of the baby shower. These are the best baby shower favors I’ve seen. Up to 100 baby shower bingo cards – all different – ready to download, print & play immediately. So you’re planning a baby shower & looking for the perfect game for your guests. You want to make sure it’s a game everyone can play – no matter how old or how young. It also has to be FUN – something your guests can get into. There are LOTS of baby shower games out there to choose from. Some are hilarious but others… not so much. Ready to play – all you need is 1 bingo card & a pen for each guest! Game 2: Play During Gift Opening! You need 1 Baby Shower Bingo Card per person (they are all different)! I can send you 10 FREE baby shower bingo cards if you leave your email. Here are your Bestselling Toy selections- as chosen by the ones who matter most – you! Chubby bathtub crayon is fun to hold! There are lots of fun baby shower game ideas, and I like prizes based on the game theme. If the mom-to-be is having a baby girl, I LOVE this pink nail polish with the “It’s a Girl” tag (although blue would work too!). Be the coolest host around with these pretty & handy USB sticks! Coming in a variety of colors & not at all expensive, you get all the fun of a toy with the practicality of a grown up! A Personal Pedi Foot Care System will go great with the previous gifts as a theme – nail polish, lotion, pedicure. This would be the BIG prize to give out toward the end of game play. Another adorable way to present a prize with a homemade touch is with this “Pedicure in a Jar” consisting of basic pedicure tools, nail polish (1-2 polishes per jar), and cotton rounds all tied together in something like a mason jar. To really personalize, order these round labels for the lids to match with you baby shower theme colors. I’m a sucker for any kind of stationery. Depending on your guests, you might want to stay away from anything too “crafty”, and stay with more generic (but cute) office supplies that everyone can use. These gorgeous note packs come in a dozen different themes. Vicotoria’s Secret Pink Lotion comes in a variety of lovely bottles & is oh so girly. These prizes are perfect for these FREE baby shower games! #1 – Baby Shower Scattergories is available in 5 different versions for free download! Choose from a normal version (boy names, girl names, baby brands) or for a crazy group checkout my FREE Adults Only version! Once the laughter finishes & the scores are tallied, a nice gift for the winner would be a game of Scattergories to take away! Another fun way to go would be a pretty notepad set (maybe as a 2nd prize). #2 – Baby Gift Bingo winners could be given an item from the actual bingo card (gift card, frame, pretty towel). You may want to have 2 prizes ready for this game if you continue to play until someone crosses off all the items on their bingo card. #3 – Who’s That Baby? uses guests baby photos, so a photo frame would work really well. I like these photo album flip frames because they make excellent gifts. #4 – Diaper Change people either love or hate. I think it’s a good game for guys to play at a coed baby shower. Once they have their fill of chocolate and dirty diapers, the winner should be happy with a 6-pack of beer. You could really up the ante by giving out any of these “mustache” themed items (who knew there were so many to choose from??)! #5 – Mommy Mad Libs has an obvious prize choice, as there are so many Mad Libs booklets to chose from – girls just wanna have fun, diva girl, in love, happily ever after, worst-case scenario survival handbook, etc). Your guests will love the nostalgia, and your wallet will love the price! Duct Tape has been popular with men for a while, but now it is all the rage with women & even teenagers! For coed baby showers Duct Tape comes in all kinds of prints now – a prize guaranteed to be both entertaining & useful! Print out some of these Duct Tape craft ideas to go with the prize for a real laugh! More fun & funny choices for coed games coming soon! If all else fails, gift cards to popular stores are always appreciated. Still not sure? Try running our custom search here! UPDATE: There are now 6 free printable baby shower games available here and here!